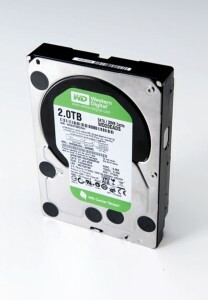 If you need the maximum amount of storage in a single 3.5″ hard drive then you can now get the Western Digital Caviar Green 2TB (that’s almost 2,000GB or 2,000,000MB or 2,000,000,000KB or even 2,000,000,000,000 Bytes!). The Caviar Green “focuses on quiet performance and lower power consumption. The 2TB Caviar Green has four 500GB platters spinning at variable rates between 5,400 and 7,200rpm, with a 32MB cache, and an areal density per platter of 400Gb/square inch”. This is probably not your operating system hard drive but it’s better to hold all your data. Maximum PC, my favorite hardware review magazine, reviewed the Western Digital Caviar Green 2TB and they gave it a 9/10 score. With it being the “Highest-capacity consumer drive on the market”, “Low power consumption” and Quietness as strong points. How to buy it in Saudi Arabia? Since it’s a Western Digital hard drive then you will probably find it at their dealer in Saudi Arabia, Nahil Computers hopefully soon. If not then try your luck at Softland. Or just buy it from NewEgg or Amazon and ship it using myUS or Aramex.